British baseball, sometimes called Welsh baseball, or in the areas where it is popular simply baseball, is a bat-and-ball game played primarily in Wales and England. It is closely related to the game of rounders, and indeed emerged as a distinct sport when governing bodies in Wales and England agreed to change the name of the game from "rounders" in 1892. As a traditional bat-and-ball game, its roots go back much further, and literary references to baseball and rounders date back many centuries. The sport differs in a number of ways from the internationally known game of baseball. Delivery of the ball – The ball is thrown underarm. As in cricket the delivery is known as bowling. In baseball it is delivered overhand, sidearm, or underarm and is called pitching. Number of players – There are 11 players in a team with no substitutions allowed. Baseball is played by nine players at a time, and while substitutions are allowed, a player who leaves the game may not re-enter it. Number of innings – (Note that British baseball uses the cricket terminology of "innings" as both singular and plural, while baseball uses "inning" for the singular.) In British baseball, each team has 2 innings. An innings ends when all 11 players are either dismissed or stranded on base. A regulation game of baseball consists of 9 innings, and each team's half of an inning ends when 3 outs (dismissals) are recorded. Bases – the bases are designated by poles rather than bags. Bat – the bat has a flat striking surface, where in North American baseball it is entirely round. Scoring system – In British baseball a player scores a run for every base he/she reaches after hitting the ball. He or she will not subsequently score when moving around the bases on another player's hit. The equivalent of a home run scores four runs. As in cricket a bonus run can be awarded for excessively-wide deliveries. In baseball, a player scores a run only on a successful circuit of all four bases, whether on his own or another player's hit, or by other means such as a walk or stolen base. Field of play – The ball can be hit (and scored off) in any direction, where in North American baseball it has to be hit in the zone bounded by the lines to first base and third base. Despite these similarities with cricket, the game is much more like baseball in style and operates on a near identical, but smaller, diamond. There are also many similarities to rounders, which is often considered a transitional game between cricket and baseball. The basic concepts of British baseball cross-blend the basic concepts of cricket and the more standard versions of rounders. The modern rules of British Baseball were codified in 1892, when the term 'rounders' ceased to be the sport's official name. During the same time, the South Wales Baseball Association was established to govern the sport which was popular in Cardiff and Newport. The first recognised international match was held between England and Wales on 3 August 1908 at the Harlequins Ground in Cardiff, Wales winning 122 – 118. Playing in the 1908 international were three former players from Cardiff RFC, the local rugby union club, one of whom, Viv Huzzey, was also a former Wales international and professional rugby league player. 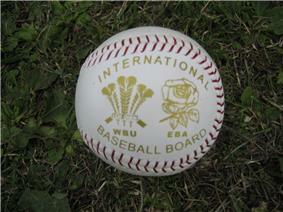 The International Baseball Board was founded in 1927 and is the international governing body. The only members are the English Baseball Association and the Welsh Baseball Union. 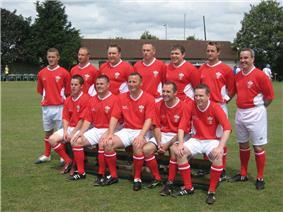 Men's representative teams from England and Wales still meet annually in an international match. The centenary international was also held in Cardiff in 2008 with Wales winning. As well as the full international, a similar game is held for 'B' teams and for juniors. The game has maintained a strong following only in two areas – Merseyside in Northwest England and South Wales, especially Cardiff and Newport. By 2006 participation levels in Liverpool had slumped considerably to a point where only four clubs remained active – All Saints, Anfield, Breckside and Townsend. The game in Wales is in a much healthier state and playing participation in the women's game has actually grown in recent years. 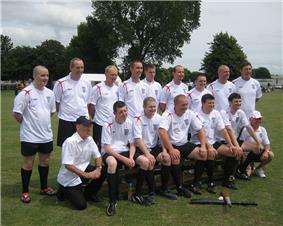 Local league and cup competitions have been organised in both countries for many years and an annual international match between England and Wales has been held since 1908. A crowd of 10,000 watched the 1948 match played at the Cardiff Castle grounds. 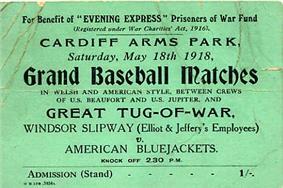 Internationals were also held at Cardiff Arms Park and Goodison Park, Liverpool. Crowds have declined in the last quarter of a century but the England-Wales match can still draw 1,000–2,000 spectators. Particularly, the game is often played during physical education classes in high schools and primary schools, as it allows the inclusion of a high number of pupils at once, and can quickly and easily be played. Several players who became notable in other sports have played British baseball. In Wales, these include association football players Terry Yorath, Nathan Blake and Phil Dwyer, and rugby's Terry Holmes, Mark Ring, David Bishop,and Wigan Rugby League legend and record points scorer Jim Sullivan. In England, the most famous sportsman to have played British baseball was Everton and England football star Dixie Dean. Among those who achieved fame as British baseball players were Welshman Ted Peterson MBE, whose international appearances stretched from the 1930s to 1960s, and Irish-born Richard Paddy Hennessey, renowned for his fast bowling. The sport is the subject of a song, "The Baseball Song", by The Hennessys, from their album Cardiff After Dark. Martin Johnes, 'Baseball, class and community in south Wales, c.1880–1950', International Journal of the History of Sport, 17,4 (2000), 153–66.